With every stitch, clothing designer Radka Kubková, one of the most striking personalities on the Czech fashion scene, communicates her distinctive style. 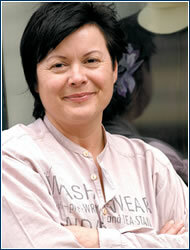 RADKA KUBKOVÁ builds her work on proficiency in demanding textile techniques like sewed lace, making bobbin lace, embroidery, and weaving, which she studied at the Training Institute of Artistic Production. “This experience is reflected in a feeling for material and a completely different view of the matter than classically trained designers have,” Kubková explains. Then, in the 1980s, she drew on this multifaceted preparation while restoring historic textiles in the State Restoration Studios. At that time she also drew attention with her original collections of leather accessories, handbags, gloves, and belts, which she presented at gatherings of fashion designers at Bertramka in Prague. “The fashion public was literally fashion-starved at that time, and there was a scramble at similar events involving fashion collections,” she recalls. During the post-revolution decade, Kubková designed accessories for the new design boutiques and supplemented collections like those of Timour et Group or E.daniely, until she finally opened her own boutique DOK č. 5 on Týnská street. “To work for clients, where design must merge with a person’s practical needs, brings me just as much satisfaction as creating artistically audacious works for shows,” she says. Kubková’s restrained style enchants with the beauty of clean lines, singularly soft harmony of materials, and creative detail. “I design things that are simpler and timeless, but at the same time always enlivened with an unexpected factor like interesting embroidery or a tailoring element,” she explains. She also enjoys using things based on current trends, like frayed, unrefined borders. “But every design’s secret of success is a perfect pattern based on current tendencies and silhouettes, which are constantly developing,” notes Kubková. “I let myself be affected by the overall fashion atmosphere, which I transform into my creative line,” she adds. 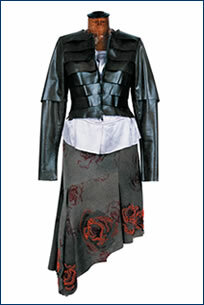 As a part of the “2000+1 Seeking Lost Elegance” group project, which freely followed up on the former Bertramka, Kubková designed clothes on the theme, “Imprints of Prague Architecture” or “Études,” inspired by Prague gardens. She presents her seasonal collections at Prague’s Fashion Week shows (at which she won the Artist of the Season award in 2003), at the Brno Style show, and at group exhibitions like Design Blok. “Show designs mostly present a certain hyperbole, so when I take them as a basis for collections for shops I first set aside overly extravagant designs and create things that are more informal items for the less exotic pieces,” states Kubková, who since last year has been sharing a boutique with Hana Havelková at number 10 Dušní street. 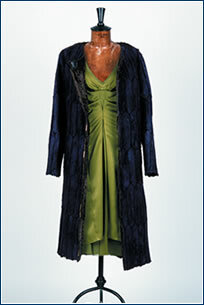 Elegance in a metropolitan environment can be conveyed with a combination of practicality and flair. 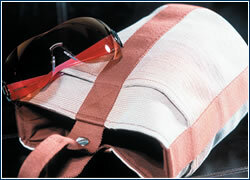 Linen bag with pockets, CZK 10,800, Herme`s, rose-tinted glasses, CZK 6,050, Salvatore Ferragamo. 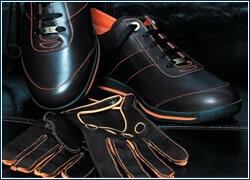 Light foot, firm hand: men’s sports shoes, CZK 12,600, Louis Vuitton, driving gloves, CZK 4,990, Dunhill. 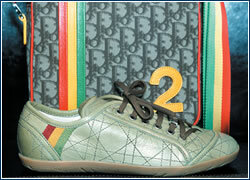 School outing: handbag made of oilcloth, CZK 14,150, women’s leather tennis shoes, CZK 8,810, both from Dior. 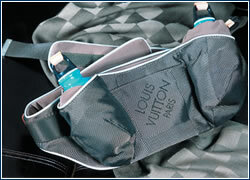 Last rescue: jogging belt with water bottles, CZK 24,800, Cashmere shawl, CZK 12,000, both Louis Vuitton. Something from Notting Hill: An absence of mid-price designer brands on our market was discovered by entrepreneur Grainne Lucey-Tomiczek, so she created the Kali boutique, inspired by small, trendy shops on London’s Notting Hill. The shop brings a colorful jumble of fresh and very feminine trifles for creating distinctive outfits from brands like Diane von Furstenberg, Paul and Joe, Frost French, and Earl Jean.